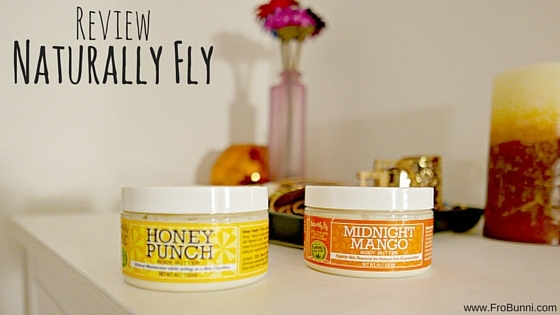 A month ago, I was sent the Honey Punch and Midnight Mango Body Butter from Naturally Fly. Since I've never used a body butter (I'm a lotion kind-of-girl), I wanted to try these products right away; I opened it and the smell hits you immediately...they smell absolutely delicious! But not in an overpowering, artificial way. They smell very natural. Like you're making a honey cinnamon bun or cutting open a mango. And they are whipped! That part actually surprised me because I thought they would be hard. You don't have to rub it between you hands to make it pliable, it's perfect right out of the jar. Fun fact about me: I almost never read directions to products, which is why I started using this on my hair as a sealant. Despite the words "body butter," I figured it was a hair product. But lucky for me and my high porosity hair, especially my ends, it actually real helped to seal moisture in my hair leaving it soft and moisturized for - wait for it - three days! 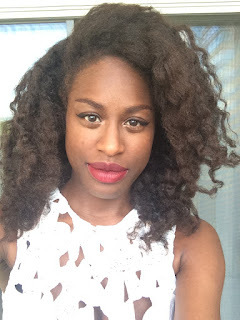 Yup, soft and moisturized hair with no breakage for three days. And for me that never happens. So, Naturally Fly Body Butter can most definitely but used on hair. A little love butter goes a long way, scoop a small amount, rub together in your hands until your body heat melts the love butter, gently apply to desired area. Smooth over freshly washed skin at least once daily, concentrating on your heels and extra dry areas. Keep your skin looking healthy, hydrated with a natural glow. Well, damn! I've been using it wrong for that last two weeks. I thought, "no worries, this is perfect" since my eczema has recently started to flair again. If you've never had eczema, it's very bothersome, itchy, and annoying. When it flares, I start having little dry patches all over my skin that makes me really self-conscious. And nothing, and I mean nothing, really helps to keep it soothed, but...the Naturally Fly Body Butters did. Twice a day, I apply to the affected areas and they don't itch, and not only that, they look less noticeable because they're not dry. It's amazing! I totally recommend Naturally Fly products, I have recommended them to family, friends, and coworkers, already. You will not be upset if you purchase this product, trust me! Clay as a Setting Powder?